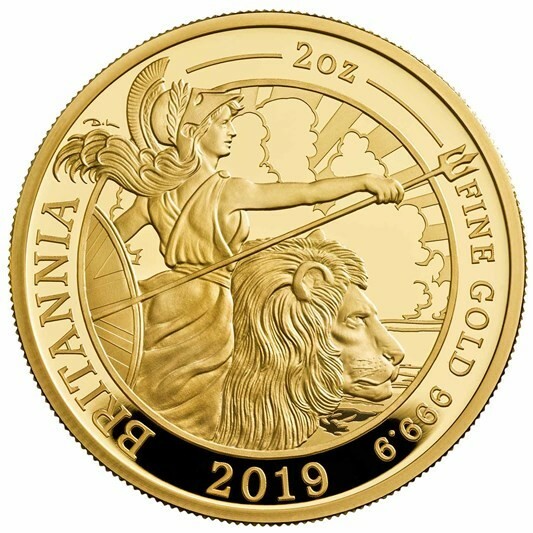 The Royal Mint has launched (4th February) the new designs which are included on the reverse side of the popular “Britannia” range of bullion coins. Each year, the Royal Mint releases a different interpretation of the United Kingdom’s most enduring allegorical symbol and national icon. Concerning the symbolism of Britannia, a female figure representing the island of Britannia, she first appeared around 2,000 years ago on the coins of Roman Emperor Hadrian in the second century. She has since appeared on English and British coinage under every monarch since Charles II’s reign in the 17th century. The story of Britannia is intimately linked with the story of the nation she represents. Brilliant Uncirculated silver coin. Hover to zoom. 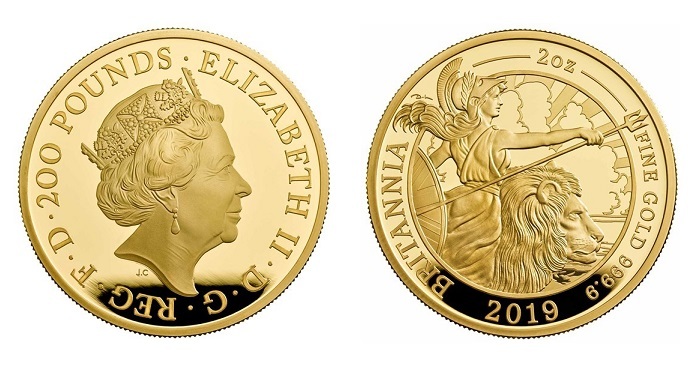 Aside from the new design, a two-ounce gold Britannia coin makes an appearance in the range and a Brilliant Uncirculated silver one-ounce version is also included. 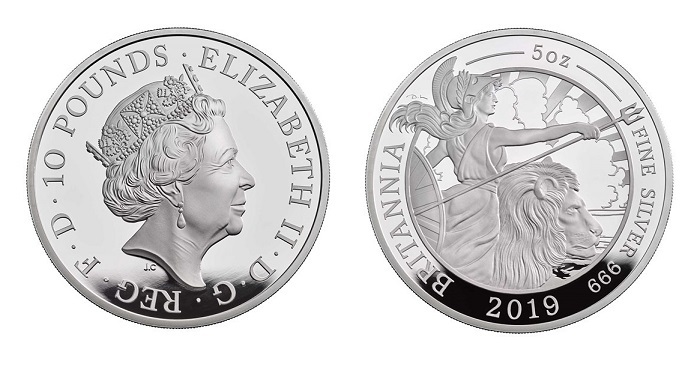 The reverse design of the 2019 Britannia is the work of David Lawrence, whose interpretation of Britannia is his second in two years. He offers a rendition of Britannia standing boldly with a lion by her side, lending her an air of consistency as the current and previous incarnations are compared side by side. For this design, David commented that he was influenced by the great engravers of the past and referenced their work as having a classical grace and gravitas that he was keen to recreate. The lion was an essential inclusion, as is the shield and trident. The result is an Anglicised version of ancient Rome. 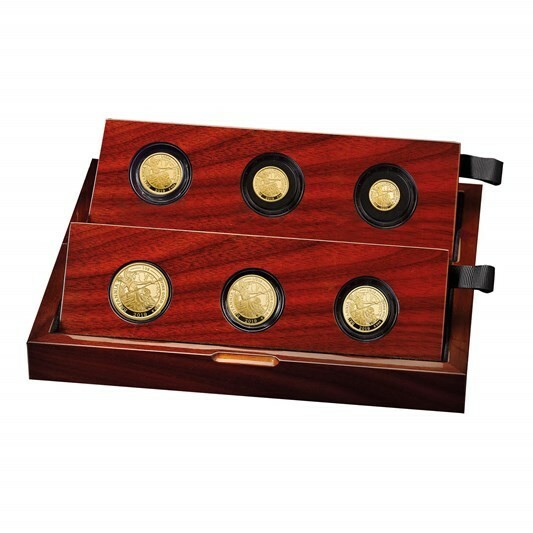 A six-coin gold set (150 sets) is available, with sizes ranging from one ounce (£100) to 1/40 ounce (50 pence), with the three-coin set (130 sets) consisting of the 1/2 ounce (£50) and the 1/10-ounce (£10). A new and larger gold three-coin set, which includes the five-ounce (£500), the new two ounce (£200), and one ounce (£100), are available as separate purchases. 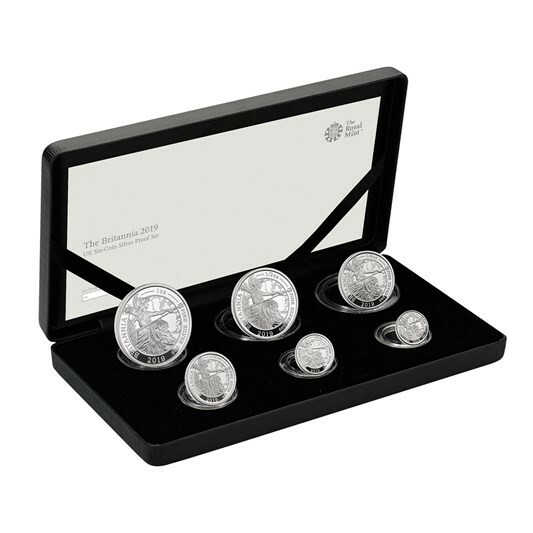 A silver six-coin set (950 sets) is also available, ranging in sizes from one ounce (£2) to 1/40 ounce (five pence), with the one-ounce silver Proof and Brilliant Uncirculated pieces available separately. A 1/4-ounce platinum coin with a face value of £25 is also added to the 2019 Proof Britannia range and has a mintage of 240 pieces. 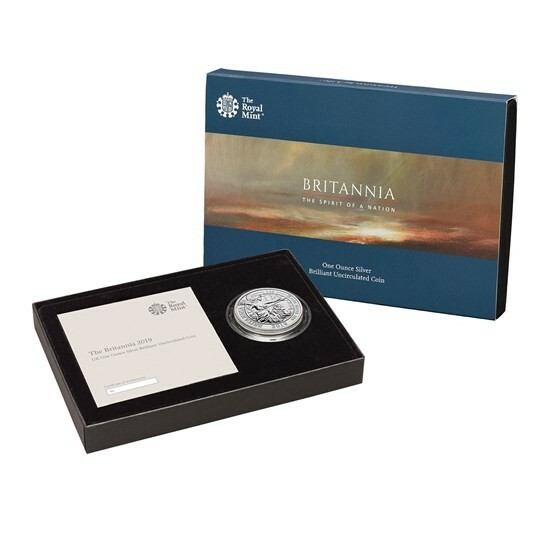 Each Britannia set and coin is housed in a Royal Mint-branded case, tailored accordingly to the contents, and is complemented by a booklet that reveals Britannia’s journey through history to the present day and details the inspiration behind the design. For more information about these coins and others offered by the Royal Mint, please visit their website.